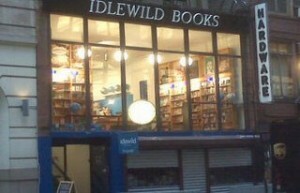 First of all, I’ve got to say, this new bookstore is a must-visit for any traveler to New York. Just minutes from Union Square, the recently opened Idlewild sits on the second floor of an old manufacturing building and overlooks 19th Street. Inside, floor-to-ceiling windows dramatically grace the front of the store, allowing in as much sunlight as possible from the cavernous-like side-streets of the Flatiron district. The hook is that the books, both travel and fiction, are grouped by country rather than author, allowing you to load-up on a country’s literature along with the basic travel guides (next to the Colombia Lonely Planet guide was Gabriel Garcia Marquez’s entire catalog, and one shelf down I found Cortázar and Borges mixed in with the Argentina and Patagonia guides). I’m so jealous: this is the store I wanted to open one day, except mine would’ve been in Williamsburg, Brooklyn, and it would double as a coffee shop (and later on, after its immense success, I would install a vast array of security cameras and spend my later days as a recluse holed up in the penthouse suite above, watching my customers from a wall of digital screens and collecting my bodily fluids in glass jars). Back to the talk. 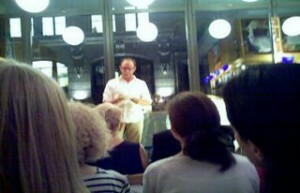 Matt spoke for about an hour, beginning with some anecdotes from his summer trip. The idea of the Grand Tour was to try to recreate the tours the wealthy British would do in the 19th century, except his would be neither British nor wealthy. For example, the British of the day would often throw lavish parties in Paris and invite all of the city’s aristocrats so as to attempt to pick up the customs and manners of French high-culture. So Matt threw a party too, except his was pot-luck and was attended by friends and colleagues and was probably actually fun to attend. Matt also spoke about his beginnings as a travel writer, which began when he left for Vietnam after college to write a novel about living in Vietnam. Instead, after a failed pitch to the NYT, Matt was contacted later on by them to write three articles about living in Vietnam. The NYT was in need for a replacement for their Frugal Traveler column, and a few months later he was it and he hasn’t looked back since. Matt revealed that he’s now hard at work on his first book, which is tentatively going to be called “The Frugal Traveler Guide To Travel,” and which will include his practical advice for travel (use a Capitol One credit card — they don’t charge fees for foreign ATMs) to the not-so-practical (don’t go to bars in Vietnam where the maître-de is a dwarf dressed in a tuxedo — duly noted). Also, more surprisingly, Matt told the audience that with the impending birth of his first child he’s doubtful that he’ll be doing another trip next summer for the NYT (trips in the past have been an around-the-world voyage and a U.S. road trip). So there you go travel writers, sharpen your pencils and break out your résumé, stop by Idlewild when you’re in NYC, and be sure to check out Matt’s blog for some inspiration next summer.